GDY-309 , of Dalmor SA built in the Gdansk Stocznia (shipyard) in 1990. 3708 tons, 95m long. Stern-loading trawler and factory vessel. 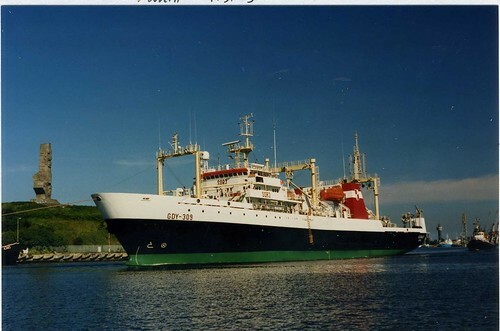 The radio call sign of the ship is carried on the bridge...SQRT In 1998 the vessel researched Pollack stocks in the Bering Sea. The name ACAMAR may be deciphered on the side of the bridge.